The Liberty University Robotics Club placed seventh out of 10 in the VEX Robotics Competition Feb. 5, 2016, which took place in southern Maryland. According to the club president, sophomore Jonathan Woosley, the team had not planned to even enter the competition. However, because of student interest and faculty support, they made a list of all the components they needed to compete and presented it before the dean of the engineering department in order to get sponsored. He said Liberty was competing against some of the best robotics teams on the East Coast, as four of the other teams who competed had qualified for worlds last year. The world competition will take place in Kentucky in April 2017. Part of the team’s confidence of going to worlds derives from them having a much longer time period to build their robot and practice beforehand. Woosley, who has been interested in engineering since he was 13 years old, joined the club his freshman year. He said the robotics club began six years ago with students Matthew Lewis and Nathan House. They were fifth-year seniors when Woosley joined the club, and they were looking for the next leaders. 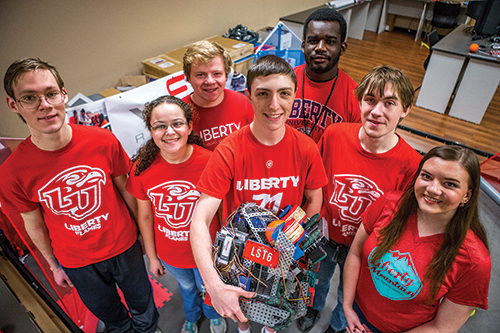 Approximately 30 students of various majors make up the Liberty Robotics Club and are split between two major teams and many other, smaller side projects as well. The VEX team is geared toward freshmen and sophomore members who can compete in a less complex competition. The other team, for juniors and seniors, is planning on competing in a more complex competition that will require more research and creativity, Woosley explained. The competition, which took place March 4th in Utah, is an international one hosted by the Mars Society, and 63 teams from more than 20 countries competed. Woosley said they built a full-scale Mars Rover. The Liberty Robotics Club meets every Tuesday at 6:30 p.m. in the engineering department on the third floor of DeMoss Hall. There are also many sub-meetings throughout the week, depending on the different teams. For example, the Mars group is split up between four small teams: electronics, mechanical, communications and programming. Each team meets once or twice during the week. Woosley said the Robotics Club is open to students of all majors who are interested. They currently have several mathematics majors, a chemistry major, as well as electrical, mechanical, computer and industrial engineering majors. Woosley said the club has come a long way, and he feels confident in its abilities for the upcoming competitions. “This year has been really encouraging for me (because) the administration has been really supportive of us in giving us the equipment, the space that we need, and all the resources,” Woosley said.